The average wedding in Britain costs around £23,000, so it’s no surprise more couples than ever are choosing a foreign setting for their big day, combining the chance for an exotic break with tying the knot and maybe even saving money. Here are a few of the destinations which are becoming popular. 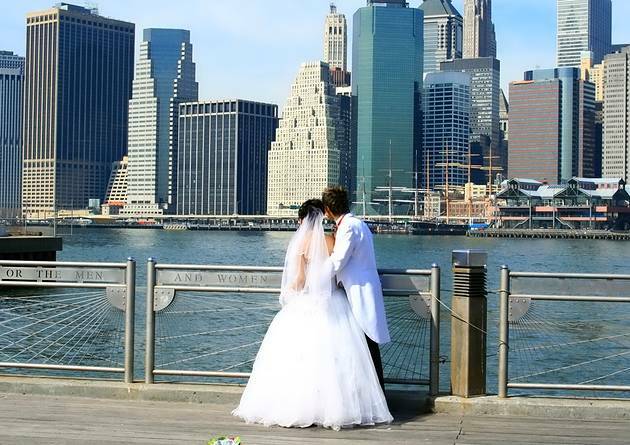 Quick weddings got a boost when the Manhattan Marriage Bureau opened at 141 Worth Street. The 20s building has an art-deco feel, and the elegant wedding chapels feature artwork on loan from the Brooklyn Museum of Art. The wedding licence costs just $25, leaving you plenty of spare bucks for cocktails and horse-drawn carriage rides round Central Park. Lesic Palace, Korcula, Croatia offers a stylish house-party wedding. The building is a restored 18th-century Bishop’s Palace with a separate apartment on each of the six floors, each with four bedrooms. The palace is in the heart of Korcula town, famed for its elegant Venetian architecture and beautiful beaches. Break out the Cuban cigars with a colourful wedding on the atmospheric streets of Havana. Stay at the Saratoga - a lavish hotel located in front of the famous Partagas cigar factory, in one of the busiest parts of the Cuban capital - and be transported by vintage car or horse drawn carriage to an 18th-century house in central Havana for the wedding ceremony. If its lions, giraffes and wildebeest you want as witnesses then the Mara Intrepids Camp on the banks of the Talek River in Kenya is luxurious with an elevated game-viewing platform and swimming pool and 30 elegant tents with four-poster beds and modern en suite bathrooms. The unspoilt landscapes of Dominica offer something different from the traditional Caribbean beach wedding. The ceremony can take place by waterfalls or volcanic rock pools, or on one of the Atlantic beaches, and the island is also a perfect honeymoon spot, with diving, snorkeling and whale-watching on offer, along with the more traditional Caribbean pastimes of enjoying and rum punches.